Finding a camp site close to the city, is it easy? Can you save money on accommodation? The short answer is.. absolutely, it is much cheaper to go camping than stay at a hotel or motel for several hundred per night. We have found some great hidden gems that are sure to keep the family satisfied. Remember, with a little preparation and planning camping near Sydney can be dead set easy. After hours of sifting through blogs, .gov websites and the like we have put together a list of our to picks. Seal Rocks is a beautiful coastal destination three hours from Sydney. Four beaches are available in the area to swim, surf, fish and relax. There is a Sugarload Point Lighthouse walk that offers stunning views and if your lucky spot the odd whale when the time is right. Bushwalking is also popular in the nearby Myall National Park. At this beautiful coastal spot three hours from Sydney, you can take your pick from four beaches to swim, surf or fish in. If you’re feeling energetic you can walk to Sugarloaf Point Lighthouse and watch the whales meander past, or go for a bushwalk in the surrounding Myall National Park. The campsite has a modern toilet, BBQs, fresh water and sinks for washing up. Berowra Creek is found north of Hornsby within the nsw high country. The area is home to a plethora of eucalyptus gumtrees, so be on the lookout. The surrounding area offers excellent places to have a picnic and a playground to keep the little ones occupied. If you want to really go bush, then the Cox River area is right up your alley. Camping is completely free, no booking is required and is a case of first in first served. Pit Toilets and untreated water is available along with a few picnic tables. 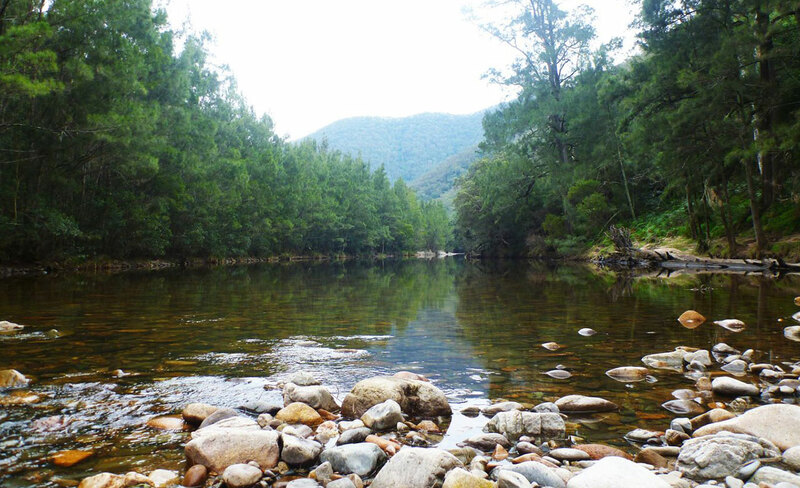 The river offers anglers some excellent trout fishing opportunities, if fishing is not your thing you can explore one of the many bush trails in the area. The campground is around 2 hours drive from Sydney. Lane Cove National Park, not far from Sydney’s city centre, is the perfect place for a family adventure or a weekend away. Explore historic sites along the Heritage walk or enjoy a picnic, canoe or go birdwatching. The Basin offers excellent facilities along with a sheltered beach, inland lagoon and picnic areas. The campground can accommodate up to 400 campers. Set up your camp, enjoy a swim or a bike ride and be on the lookout for the local wallabies and kookaburras. There’s no car access to The Basin, so park at West Head Road and then walk or cycle. You can also arrive by water taxi, boat or a ferry departing from Palm Beach Wharf. Have You Got All Your Camping Gear Organized? If you need to update some of your camping gear and do not want to spend the earth then visit Wild Earth. They are the number one Australian Online Retailer of camping and outdoor gear. They offer 80 Day returns and buy now pay later facilities.